Let me start by simply saying that I really enjoyed the Danganronpa games. When I say this, I am referring to the first two video games in the Danganronpa series. These are great little anime mystery style Visual novel games with some amazing voice casts and fun little mechanics. The characters, plots and the game mechanics are what make these games so interesting and that is where the anime fails. 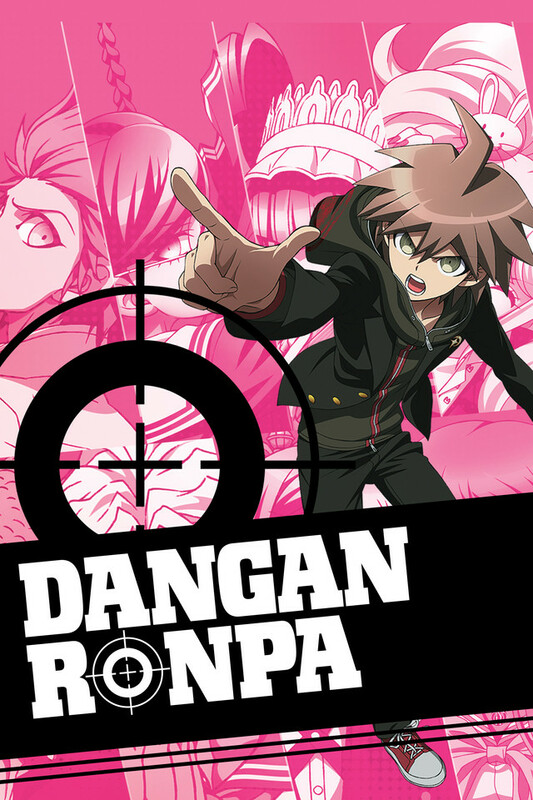 This anime covers the story from the first Danganronpa game and there is a reason why there was never a sequel anime to cover the second game despite it being better received in Japan. In my opinion, the main reason for this was that the anime was just a rushed mess with very bad pacing issues and setup. Another big reason was that the story doesn't lend itself to the anime format as much as it does to the video game format. Many of the integral elements for each of the arcs are not mentioned until their respective class trial in the anime. It becomes very hard to follow these parts of the anime and it makes the character's motivations feel very flimsy at times. It also can feel like the writers are just making things up due to how rushed it is. For instance, in the first Mystery arc, there are many clues which are glossed over in the investigation and the story leading up to the class trial which are pivotal for solving the actual murder case. A very small example of this is that a sword was used in the murder but they never show how the character gets the sword or where it came from. Worse yet, none of the characters even so much as ask about the sword because it was explained in the game but not in the anime. Little examples like this really add up in the end and make this anime feel really wish washy. Also, the game elements that they kept in the anime do not translate to the medium of anime. It would have been very easy to actually tell this story in the medium of anime if they had restructured a few things. The studio that made this anime choose not to do anything except truncate some of the plot elements in the story. As a result, the anime suffers rather greatly from these game elements where as the games excelled at using these game elements to further their respective stories. Anyways, play the two Danganronpa games. Both of them are now available on the PC through Steam as well as other platforms. Both games feature fantastic localizations and an amazing cast of Japanese voice actors. Just ignore that this anime exists because its not really worth your time. If you like blood, violence, and mystery this show is for you. Great characters and great story. It is a murder mystery show about high schoolers forced to murder each other in order to escape. It had me on the edge of my seat watching the whole thing in a day. I absolutely LOVE this anime, but of course the game is better. That's the reason I find this anime to be underrated or disliked. It's compared to the game, but it's still a good show on it's own. I understand, it's way shorter than the games and doesn't go into as much detail during investigation time or class trial time, but if you want to go watch a long anime go watch One Piece or Dragon Ball or Bleach, or spend $30 - $60 on the game. I know, it's not as good as the game and I agree, but give it a chance and maybe you'll love it. I wanted this to be good, I really did. After playing the game I decided to give the show a try. I barely made it a few episodes in before giving up on this butchered anime adaptation of a great game. Not only do they leave out a LOT of character development, but they also leave out a lot of things relating to the Investigations and Class Trials as well. While the Music and Art Style is still fantastic this is definitely a solid pass for any fans of the franchise. Go watch the newer Anime and Movie, because they are far better, & actually add to the Danganronpa universe instead of trying, and failing, to copy one of the games. Play the game instead. Seriously. I was curious about the anime after watching a streamer play the newest Danganronpa game on twitch. Absolutely loved the first episode...until I realized the story exactly matched the first Danganronpa game. I threw on the breaks and started playing the game instead. The game is phenomenal. It plays out like a visual novel with mystery solving game play. About 30 hours to complete the main story. I tried to come back to watch the anime after I finished the game? Looked like garbage after playing the game. So much story and character development lost. It's okay, you can get a kick out of it. Just as a side-note, I have never played the games, but I've heard good things about them. Naegi is accepted into Hope’s Peak Academy, an elite private school that only accepts the very best. The whole thing is revealed as a death trap, as administrator Monokuma, an sadistic animatronic bear, declares that you can only get out by killing a classmate. The most interesting part of the series are the trials, where the remaining students try to deduce who is the murderer. This anime really looks great and the characters are enjoyable, Ishimaru and Mondo especially. I think the biggest problem is the pacing and rewatchability. This is a anime based on a visual novel mystery video game. Most of the backstory on the characters and their development is almost non-existent. It's a really short series. And once you've watched it once, the second time really doesn't surprise you that much. Interesting and fun to watch though. I'll try the games sometime and I'd suggest for everyone new to this (including me) to start from there. Danganronpa was thrillingly satisfying to watch. I loved the tension that appeared in every episode, and the amazing mysteries that they worked to solve. I really liked the characters as well, and how clear cut everything was. It was obviously not a kids show and isn't recommended for anyone who dislikes murder or mystery, but if you do this is the show for you. It's full of action and I can totally recommend it to anyone. There were a few things I disliked, but those were opinions and not anything of concern to anyone else. This series would probably serve best as a quick refresher or if you want to see your favorite characters animated from the first game. The actual story from the game is way too dense to fit it all in 12 episodes. it also skips a lot of character development. do yourself a favor and play this amazing series first.